In 1998 the itch to cruise became acute when several friends took cruises. Having long wanted to do so I finally took the step of booking one of my own. Being one for history and wanting to pick a ship with some sort of significance my search eventually lead to the Sovereign of the Seas. Built in 1988, she was at the time the largest purpose-built cruise ship ever constructed. Her launch sent a ripple through the cruise industry which reverberate to this day. At 72,000 GRT Sovereign carries 2,200 passengers in just over 1,100 staterooms. When I sailed on her she was a few years removed from a mid-1990s refit. 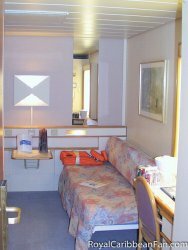 The images in this review are from my cruise aboard her in August 1999. This was the time before rock climbing walls and water slides aboard most cruise ships. The experience was that of a time largely behind us. The day of the cruise I flew into Miami from Tampa where I was visiting family. On approach to Miami International Airport I could see the looming mass of Sovereign from the air and it was then that started to realize how big she really was. My early flight was met by an agent from the cruise line who escorted us to a waiting area at the airport. We were able to complete our documents for boarding at the airport, something which has been made unnecessary by online check-in and centralized locations at the ports themselves. However the transfer from the airport to the terminal was smooth. Once boarding had begun I followed the conga line of passengers with their carry-on until we reached a balcony overlooking the dock and it was there that I had my first view of Sovereign up-close. She was simply amazing to look at, huge but majestic, rounded lines and sharp livery made her look very much like her name. The crew ushered me to my cabin, an inside berth on this five day cruise which I took alone. After taking enough time to arrange my bags and get my camera setup I explored the ship until the mandatory life boat drill. After which I purchased the departure party drink special and began a tradition that continues to this day, taking a photo of a drink with the port or ship in the background. Nassau was a port I would skip in favor of spending the day aboard the Sovereign and enjoying the peace of the ship while most passengers were visiting the shops and excursions ashore. From the decks I could see the Atlantis resort which looked unworldly in the distance. Several over ships had docked that day as well including the Disney Magic. In the early hours of the morning as both ships were preparing to depart, those of us on deck were startled by a fireworks show the Magic presented before she left port. Little Stirrup Cay was acquired by Royal Caribbean as part of the 1988 take-over of Admiral Cruises. It is next to Great Stirrup Cay owned by Norwegian Cruise Lines. Renamed Coco Cay and extensively rebuilt, the small spot of 80 miles due west of Miami is an excellent beach day and offered the chance to snorkel dive in a small area just off of the main beach. Passengers need to tender into the island since it is not able to support a pier for ships to dock at. I found that an added bonus since I enjoy the extra travel. Though one does need to be patient and in my own case I left late for snorkeling and returned early to avoid the crowds. Key West rounded out the stops on this cruise. Sovereign of the Seas docked at the Key West Naval Air Station pier. Based on that, you cannot simply walk from the ship to the shops or downtown area. Key West is also connected by causeways to Florida and is itself a major tourist stop for people driving there. So it is crowded to be blunt. The best way to my excursion was exactly by taking a Conk Train. Snorkeling at Key West and Coco Cay. At Coco Cay I went snorkeling. I choose to bring my own goggles and snorkel but still had to pay for the cruise line provided gear. The water was my first experience in Caribbean water and it was as warm as path water. The dive area had various items sunk for visitors to explore and the staff attracted fish with bait. At the dock I was met by staff from the snorkle excursion I booked. A “Conk Train” (a tram that shuttles passengers to and from major points of arrival such as the pier) carried us to the local marina where a catamaran sailed out to the dive site. The trip on the boat itself was worth the price of the excursion. We passed an old platform where Earnest Hemingway once kept a shack before having a few hours to dive in warm waters. There was a good amount of coral to be seen, the colors were vivid and the water clearer than it had been at CocoCay. During the trip back the crew offered a rum punch of some type, not being the drinking variety I didn’t have any but there were sodas to be had in its place. By the time we reached the marina I was comfortably dry and the tram ride back to the ship was enjoyable. Disembarkation in 1999 was everything which has driven the cruise industry to vastly change and improve the process. Where in the days before you were an honored guest, carefully managed as you boarded and lived on the ship, the disembarkation was a jarring and highly unpleasant experience. As is normal, most luggage is left in the hallway to be gathered the night before disembarkation. Having a flight home it is further tagged for eventual transfer to the airline in most cases. In this case, in 1999, passengers were essentially dumped in a warehouse with mounds of luggage to investigate. You would find your bags, take them to another desk who would put them into moving trucks for conveyance to the airlines. You then hoped you boarded the right shuttle bus for the airport and that was that. While there was breakfast in the morning, there was a simply unpleasant quality once you crossed over the gangplank which was nearly enough to sour the overall experience. That said, the year was 1999. And though the changes haven’t been immediate or all at once, the years since have seen a consistent and radical improvement in what can be the singularly unhappy part of any cruise-the ending.